Rich Mowatt, better known as Solarstone has been championing the pure trance movement from the very beginning of his career. The celebrated English producer and DJ has earned his place as one of the most influential leaders in the trance scene for his contributions for more than a decade. In over 20 years he has released countless timeless classics like “Seven Cities”, “The Calling”, and “Solarcoaster”. On top of that, Solarstone also has a hefty list of EPs and studio albums to his name that began from his very first artist album, AnthologyOne, which was released in 2006 to his latest cryptically titled album, .---- (yes, four dashes and a dot). The trance icon will be making a pit stop in Kuala Lumpur on April 26 for kyo’s first ever trance night. In anticipation for this special night, we’ve selected some of our favourite Solarstone trance treats to get you into that euphoric state of mind. Check out the details for kyo x Plural pres. 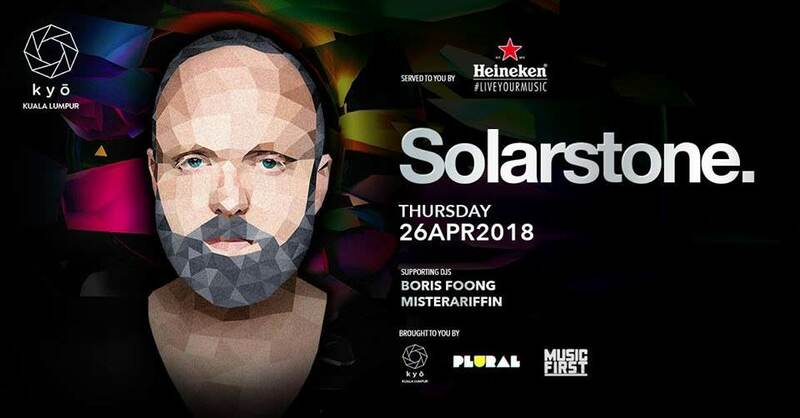 Solarstone (UK)// Boris Foong & Misterariffin below.